With an increase in popularity over recent years, businesses big and small, across a wide range of industries have embraced remote work in one way or another. Whether it’s a few staff members working out of the office a couple days a week, a whole team offsite, or an amalgamation of both, managing a group of distributed individuals poses new challenges for managers and team leaders. The purpose of team management is to foster teamwork and collaboration amongst individuals with different personalities and skill sets so that company goals and objectives can be achieved more efficiently and, in most cases, more enjoyably. Remote team management looks just about the same, except the different personalities and skill sets you are supposed to be managing belong to individuals that you have never met in person and may never actually meet. The key to managing your remote team is similar to that of a co-located team, you have to keep them engaged, create and sustain a company culture of trust and transparency, and make sure that everything is aligned with business goals. Getting the right people on board will take you one step closer towards team management success, but bear in mind that not everyone is cut out for remote work. It’s a job that requires self-managing, technological competency, and impeccable communication skills. Candidates to consider are ones with some sort of experience managing their own time. Whether it’s from previous work experience as a manager, team leader, or freelancer, or from a listed hobby such as coaching a sports team, this will highlight someone that knows how to organize and motivate themselves. Because a lot of communication will be done via email, instant messaging, phone and video calls, you also want someone who is technologically adept. If you’re not seeing someone face-to-face on a regular basis it can be easy for them to slip from your mind. Avoid this by checking in regularly with your remote employees. Even if you don’t have anything work-related to discuss, a simple email or instant message to see how they’re doing can go a long way. It will help keep your relationships active, and will make your remote employees not feel forgotten. …but with that said, make sure you don’t overdo it. One of the biggest detrimental habits a manager or team leader can have is micromanaging—don’t do this. Instead, establish trust with your team members (remember, you did recruit the right people). Trust will not only enhance working relationships, but it will also make your job a lot easier as it will give you time to complete your own tasks. There is a fine line between absence and micromanaging, and your job is to find the perfect balance. Using team management software to keep everyone in sync is a no brainer, but make sure you’ve invested in the right tools. Managing a team of remote employees may require different tools to that of a co-located team. You need software that allows you to communicate in real-time, something that will allow multiple users to collaborate, and a centralized tool that will keep all the tasks and resources in one place. 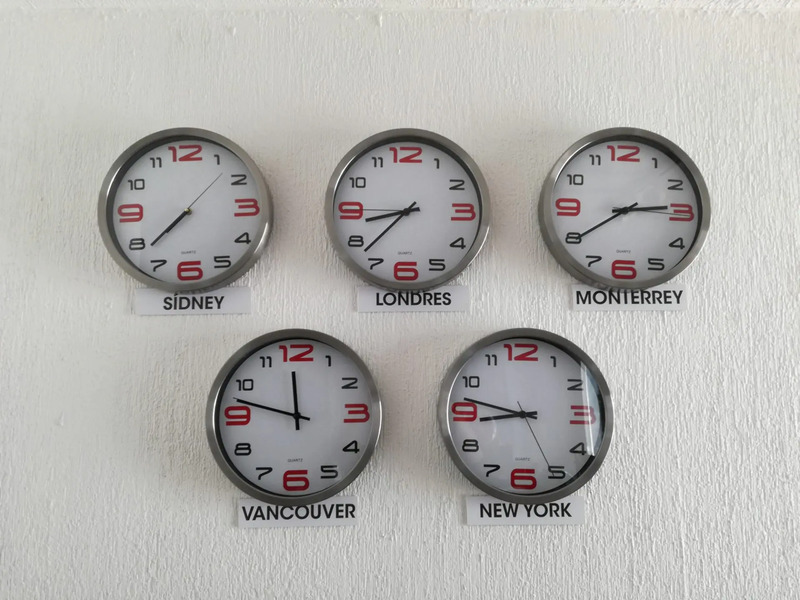 As the manager or team leader of a geographically dispersed team, one of the biggest banes of your role will be having to coordinate the different time zones so that meetings and collaboration moments are mutually suitable for all involved. You don’t want an employee having to log on at 1am just because a mid-afternoon meeting works for you. Don’t forget to also look into different cultural practices that may apply to your team. Different countries have different ways of conducting business, so be sure you and the rest of your team are aware of this. Not seeing someone on a day-to-day basis can make misunderstandings are more likely occurrence. When setting out tasks and projects, be crystal clear when defining the scope and expectations. Establish grounds rules, set the deadline, and also consider the best way to deliver the information (sometimes emails are better, sometimes a video calls are). It’s this kind of transparency that is needed to reduce the chances of error or unwanted results. Speaking of transparency, sharing calendars allows everyone on the team to know each other’s availability, and this kind of transparency is important for effective remote team management to work. On top of shared calendars, be vigilant with your online/offline status on instant messaging and anywhere else it’s used. Encourage your team to do the same. A driving factor towards team management success is getting to know your team members and really understanding what they’re about. While this is much easier when done face-to-face, a good alternative for expressing sentiments, mannerisms, and personality when communicating with your remote employees could be implementing the use of GIFs and memes. The little looped videos and images have become an important visual communication tool as of late. Encouraging the use of these visual tools is not only good for entertainment value, but can help you and your remote teams understand each other on a more personal level—just make sure that the content is SFW (that’s internet lingo for ‘safe for work’ for those who don’t know). One of your priorities as a manager or team leader is to create a culture of inclusion within your team. Not only do you have to know your team members, but they should also know each other. It may be a little more tricky with a distributed team because they don’t have the chance to bump into each other in the elevator or chat during lunch time. A team management technique you could try is to create these water cooler moments virtually by scheduling video calls between various members of your team. And if possible, encourage remote employees who live near each other to meet up every so often to work together or even go for a coffee. Just because someone works from home or a cafe, it doesn’t mean they don’t have their own goals to accomplish. Your remote employees are still employees, and they still have a career path to follow and ambitions to fulfill. Developing your team members’ knowledge and skill sets, and helping them grow within the business is imperative for keeping them engaged and continuing their loyalty. Setting your team up for success is pretty much a given for any team leader or manager, remote or not. When it comes to managing remote employees, the importance of team management is as evident as ever. Ensuring that your remote team members are engaged and on track is key to improving efficiency and achieving company objectives.